I don’t know what impact TRIUMPH’s music ever had on European soil but the American continent and Japan and Far East certainly bowed down to the Canadian trio’s magic in their prime, objections overruled. 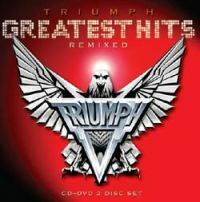 TRIUMPH’s legend revived with their induction into the Canadian Music Hall of Fame in 2008 (there’s some bonus footage in the DVD disc to take a glimpse) and now Frontiers Records presents a remixed ‘best of’ compilation with the addition of a kinda new song in the tracklist. The myth of TRIUMPH was alive and kickin’ for twelve years (1976 - 1988). The original lineup scored grand success both with their arena Rock early days but also with the more FM Rock late period. In the 70s it was the epitome of your identity to kill onstage; and TRIUMPH certainly did! With direct influence from RUSH’s progression, GRAND FUNK RAILROAD’s amplitude and THE WHO’s malice, the band’s 1976 – 1981 discography placed them on top of Canadian Hard Rock acts of the day (older readers can surely recall enough other proud outfits such as SAGA, SANTERS, MOXY and TROOPER) with some blazing killer shows all around Canada. Aiming at the American market, their 1983 – 1990 works showed a more commercial Rock profile but with nothing less than astonishing personal songwriting and some equally bombastic gig-ography. The departure of original guitarist Rick Emmett in 1988 resulted in an unstable TRIUMPH camp status there’s no particular reason to look deeper in. The main picture is 2010 finds a new compilation by the band, remixed by Rich Chycki (AEROSMITH, RUSH), pushing the songs to an incomprehensible level. I was quite aloof waiting to listen to this new(?) sound…OK, the man’s done a helluva job keeping the spirit alive while re-layering each song’s dynamics in order to create a nearing perfection collection. As for the song list, 14 songs is OK but they could have been more for the core fans’ and newcomer followers’ sake; still, the selections here are accepted in applaud, you cannot deny the class of everlasting hymns like “Allied Forces”, “Lay It On The Line”, “Follow Your Heart”, “Just One Night”, “Spellbound” and “Never Surrender”. The temptation gets bigger and bigger to the haring of a bonus DVD featuring all promo TRIUMPH video clips (hooray!) plus some bonus cuts in association with the band’s recent awards. The “Love Hurts” video is fan-made and is – in audio format, too - the preceding single of this combo. Life’s simple, so they say; “Greatest Hits Remixed” is the perfect companion for fans of guitar-driven classic 70s/80s Hard Rock who are not familiar with TRIUMPH’s history. In addition, long time followers of this impressive trio have a good reason to take hold of “Greatest Hits Remixed” since it does capture the band’s energy in a new level plus the video collection attached is a solid piece of Canadian Rock history. Long live! P.S. : “Lay It On The Line” was released as a DLC song for Guitar Hero 5 on October 2009.